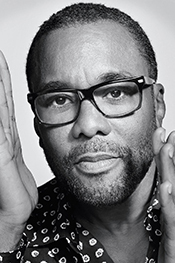 Director Lee Daniels never gave up on getting his film, Precious, made – a battle which parallels the main character’s fight for survival. Clareece ‘Precious’ Jones is sixteen-years old, lives in Harlem and is about to have her second child. She’s got a verbally abusive mother. Precious is overweight, illiterate and poor, but has an aura radiating from within that let’s you know she may be down, but not out. The film follows her gritty journey to an alternative school where she finds hope, truth and a deeper understanding of herself. Daniels’ film attracted a pretty interesting array of big-name musical talent like Mariah Carey and Lenny Kravitz to play roles. The most risky casting by Daniels though, might’ve been comedienne Mo’Nique as Precious’ abusive mother, Mary. With Oscar buzz at a steady build over Mo’Nique’s star turn, it’s looking more and more like the film’s director and the stand-up comedienne-gone-serious are having the last laugh. I spoke with Daniels about his pretty powerful film; one that takes time to remind us that every day is a new day and life is, indeed, very, very precious. What inspired you to bring the novel Push to the big screen? I read it and it blew my mind. I sat there with my mouth agape every time I read another page. I was in tears, laughter and shock. The book was like a lover and I slept with it under my pillow. Something told me that I had to bring this to screen. Tell me about the process of casting newcomer Gabourey Sidibe for the lead role of Clareece ‘Precious’ Jones. I stopped counting the people I interviewed for the role at four hundred. I had twenty girls that I felt good about and Gabby came in and auditioned for the casting director. I saw her tape and I was blown away by it. The other girls were good too, but what struck me differently about Gabby is that when we sat down to talk, she spoke like a white girl from the Valley. Who are you? I thought. I realized she was acting the role. The other girls were really Precious. If you look at the film and study it, you will see that I try to go for truth everywhere I can – from no makeup to clothing to production design to the actors. I was looking for that authenticity with Precious. However, I felt that if I had actually hired one of those other girls who were really Precious and working at McDonalds, I would have been exploiting her. She would have not been able to articulate this journey in the way that Gabby Sidibe did. Sean ‘P. Diddy’ Combs played an inmate on death row in Monster’s Ball. Now you’ve cast Mariah Carey as a social worker in Precious. What is your thought process in casting these musical talents in roles in your films? What got me into wanting to direct films is a movie called Lady Sings the Blues. Diana Ross starred in it and was nominated for an Academy Award. Richard Pryor was also in the film playing her sidekick, Piano Man. Pryor was a stand-up comedian and this was his first job in a movie. Ross was a singer and this was her first job in a movie. When you are dealing with people like comedians and singers, they work extra hard to prove the truth in the moment as an actor. In some subliminal way, Lady Sings the Blues has really influenced the casting of my films. Were you always certain about the tone you wanted to achieve with Precious and how you were going to use the lead character’s daydreams to play a part in that tone? Yes. The book is very graphic. If I had told the story the way the book was told, the movie would have been non-rated. I think that the audience needs to breathe and I try to achieve that through humor anywhere I can. Also, I do that through the fantastical world of her head. I think it helps the audience breathe through some of the rough stuff that they’re watching. The people in this film are people that I know in my life and people that you know in your life. They’re people that we chose to ignore because we don’t want to see their faces, so we turn the other way. I think we are forced to look at Precious. What I learned from this film is that I will never look away again. I will look at her and I will see her. When you were directing Mo’Nique, how did you gauge how far to let her go? Did you have to push her or pull her back? I did neither because Mo’Nique and I are best buddies. She knew what I wanted before I told her. I like working with friends because you know they got your back. Look, our films are small budgeted and you don’t have time to work with anybody who is not your friend because if they can’t do exactly what you need right then and there, it can shut you down. The filmmaking process is that delicate. One thing can sink the entire ship. I have to work with people who I know understand me and there’s a mutual love between us. Mo’Nique and I have trust. At times, the film almost feels like a stage play, mostly during the scenes that take place in the apartment. Was that a particular feeling that you felt worked for the claustrophobia of the mother/daughter relationship? Thank you for asking that question because no one else has. That environment in the house was my environment growing up. I wanted to recreate that jarring claustrophobic feeling of unsettledness. That house is not typical of a New York City apartment. In Harlem, they don’t have apartments like that. I’m from Philadelphia, so that house was recreated and a replication of my home growing up. From the fabric on the couch to the wallpaper to the linoleum of the floor in the kitchen, I feel that I captured what the atmosphere was like during my youth in that house.